Is your church championing renewable energy? Campaigning for climate justice? Looking for funding to get a green project off the ground? This month, the Church Times launches its Green Church Awards 2017, in recognition of a range of impressive environmental advances made by churches of all denominations in the past few years. Many individual initiatives have been taken by churches around the country in response to the urgent need to tackle climate change by reducing carbon footprint and campaigning for others to do the same. The awards are a means of gathering these initiatives together and acknowledging the imaginative and sacrificial work done by many hundreds of churchgoers. By highlighting some of the best projects, we hope to set good examples before others who might be inspired to follow suit. 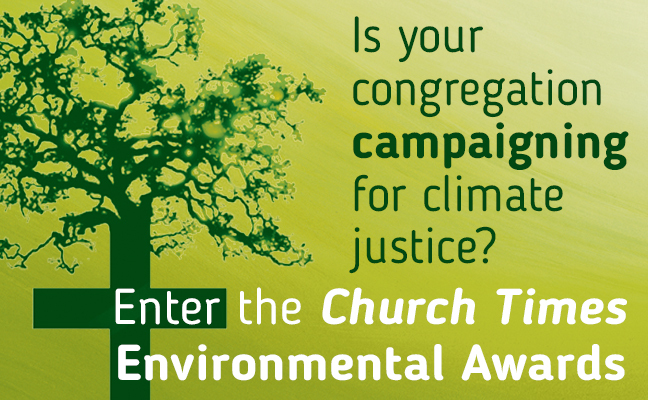 This year’s awards are jointly organised by Shrinking the Footprint, the Church of England’s national environmental campaign. The judges will be looking for projects that have made a significant difference in the past five years in buildings, outdoors, and in the community. In addition, there is an award for the most inspiring individual; and they want to support imaginative future projects. Entries are invited from churches of all denominations, and churches can enter one or more categories. The deadline for entries is 2 July 2017. Visit www.churchtimes.co.uk/green-church to download an application form.